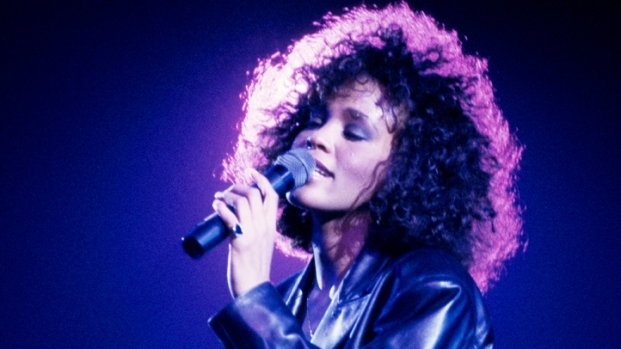 Whitney Houston was laid to rest Sunday at a brief private ceremony in New Jersey, the end of a weekend that saw the pop star's family and friends gather at a star-studded funeral to mourn her loss while celebrating her career. Fans and onlookers gathered in several places along the route the motorcade took from the Newark funeral home to the cemetery about 20 miles away in Westfield, where Houston was buried next to her father, John Russell Houston, who died in 2003. The 48-year-old singer died Feb. 11 in California, hours before she was to attend a pre-Grammy Awards party. No cause of death has been determined. 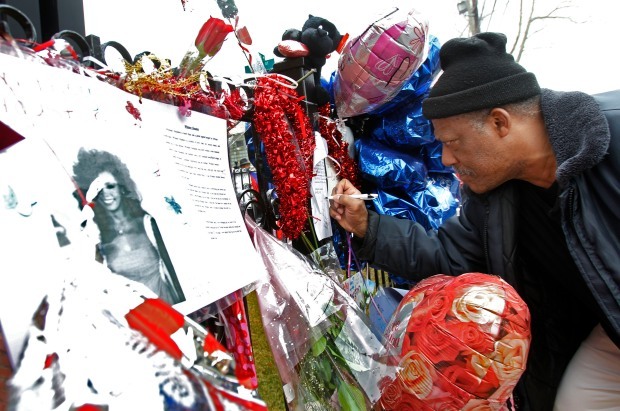 Despite restrictions and a heavy police presence, dozens of Whitney Houston's fans were determined to get as close to her memorial service as possible. Katy Tur reports. On Saturday, she was mourned at an invitation-only funeral at the church in Newark where she sang in the choir as a child. She was remembered by some of the biggest names in music: Stevie Wonder and Alicia Keys sang, and industry mogul Clive Davis was among those who spoke. Kevin Costner, Houston's co-star in "The Bodyguard," also spoke. The funeral was closed to fans, who were not allowed within blocks of the church. Still, many came to Newark to take part in what ways they could, some from as far as Miami and Washington, D.C. Fans gathered again near the funeral home Sunday morning, and some even slowly ran alongside the hearse as it began the journey to Houston's gravesite. Several yelled out "We love you, Whitney" as the hearse, which had a black and white head shot of the star in a window, slowly drove away. Barbara Davis, 53, of Newark, said she had been waiting outside the funeral home since 8:30 a.m., hoping to get a glimpse of Houston's final trip. 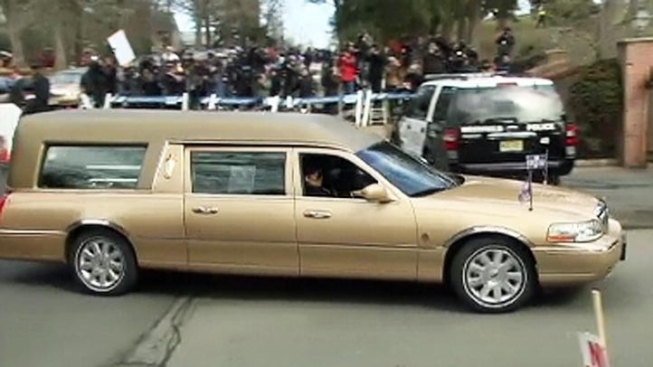 "To be here at her home-going is an honor and a blessing," Davis told The Star-Ledger of Newark. Also in the crowd was Newark resident Eva Aquino and her two granddaughters, ages 10 and 13. All three stood on a street corner as the hearse passed by, and they used cellphones to snap photos of the procession. The girls were wearing T-shirts and buttons of Houston that their grandmother had bought from vendors outside the funeral home Saturday. "We came here and bought all these things of her to cherish the memories," said 13-year-old Nalani Velez of Kearny.